Clock update's What we have done. - SAVE WILLARD'S CLOCK - THE TIME IS NOW. MAKE A DONATION TODAY. 10-8-18-Kevin Casto of the Art Junction turns in two checks at the Willard city desk for the clock tower project. One check for the water color painting Teruko Wilde and another from a Willard group. We appreciate these kinds of donations and thank those for donating to this important historical project for the clock tower. This will be a huge benefit for the residents and business's of Willard. The Roy Doster clock plaza is done and being used on a regular basis. That is just a part of this vision. You can now see that being used. See the clock tower vision now (the final piece of the puzzle) and help us finish this. Just think what the clock tower will add to the downtown. Hear that old bell ring again and see the old cast iron dials show the time. See a piece of living history when it is done. We are pushing forward and need your donations. Make your checks out to Save Willard's clock and mail them to Save Willard's Clock PO Box 367 Willard, Ohio 44890. Let's finish this together. The Time is Now! Even when the century-old Willard clock tower sat in a field next to a sewage treatment plant for 17 years sinking into decay, former Willardite Rick Reed saw potential through the rusted face dials and the old copper clad cupola. All that potential and more has been revealed in planning, blueprints and renderings of what can be a gem for Willard and Huron County. It’s been four years and with the help of local volunteers, a design developed, fundraising began for the restoration of old parts to rebuild a jewel for his hometown. It’s a multi-faceted idea for a small town says Reed. We just came off one of our best years fundraising in 2017 for the project and now they are in site of saying start the build. Reed wrote a 600-page history book using photography from Willard’s past and today called “Willard, Ohio Rediscovering History.” The hard-back coffee table book is on sale now to raise money for the project and available in Willard. The new structure will use refurbished parts off the original clock that sat on the old city hall downtown for 84 years. Once it’s craned into place the old bell will ring again. The old cast iron clock dials and hands will work as designed years ago. The old motor will be repaired and used as a static display along with other items inside the new tower. Windows will be added to the structure to see the old motor. A former Willard resident in California has donated the lighting for the top of the tower. Another donated the foundation. Cities all over the country are refurbishing and building new clocks for their downtowns. Look at the city of Huron with a new clock, Milan redid their clock tower after a fire years ago. The old Clock on the Old Shelby, Ohio Bank building is working again after refurbishment. This will be a good thing for Willard using the old-world craftsmanship from the 104-year-old clock. The group has done allot of challenging work getting to this point. But they have a long way to go. Growing up in Willard, Reed knew exactly what the structure was and why it was important to Willard to save. We have lost way too much in history that could have been used as a draw for visitors and to show potential new business we want them to come and build here. Willard has much to offer. Reed knows the clock can help with that. The clock tower will be used for diverse types of things, Reed said. This can be used as a staging area for parades, marathons, festivals, flea markets, outdoor concerts and more. It’s a profound way to keep the past alive and mix it with the present and future of Willard. The Roy Doster clock plaza is now done and being used where the clock tower will sit. It hasn’t been easy but it is moving along. Reed would like to see more of the younger generations get involved. After all they are the ones that will really benefit from this in the years to come. They could do fundraisers for the clock and have some fun with it. It teaches volunteerism and how to work with others for a common cause, Reed says. Donations are still needed and several business sponsorships are available. To make a donation write a check to Save Willard’s Clock and mail to P.O Box 367 Willard, Ohio 44890. If you are a business that would like to sponsor a portion of the clock you can contact any of the Willard clock committee members or e-mail Rick at tinbucket78@yahoo.com. Reed’s number is 812-379-2468 and available anytime. You can also see updates on social media. Just look for “Save Willards Clock” on Facebook or at www.savewillardsclock.com. purchase. We thank the Chamber and it's members for that. UPDATE!!! August 2017--Based on the last Clock Committee (August 2017) meeting we are about $135,000 short of getting the clock tower up. The footer system is now being donated. If you wanted to help Now is the time to do so. We are so close! Help save this old clock tower for this restoration rebuild. The Time is Now. Make checks out to Save Willard's Clock and mail to PO Box 367 Willard,Ohio 44890. I'd like to give the build company a go, but can't do it without the money in the bank. It's now left up to the people and business of Willard. Update 9-8-2017 WOW I was notified this afternoon of a donation to the Clock Tower project by an out of town business from Wooster, Ohio. Now that wouldn’t be very unusual. It just for some reason caught me off guard. So, I called this company up and told him who I was and why I was calling. After thanking him for his donation I asked if he had a connection to Willard. His comment back was no I don’t. He said I made the donation because of his love for small towns. He was raised in a small town. He runs a siding company that is currently working in town repairing and replacing hail damage siding on many Willard homes. The Business name is Black Diamond Contracting LLC. He said someone had mentioned the clock tower project to him and he ask for more information. Said it was just his way to help. Now that is small town love from a guy that really has no connection to Willard but is in town making a living for his family in Wooster. He took the time to look at what this project means to a small town and wanted to help. Thank You to Black Diamond Contracting LLC. I appreciate your support and help on this project. They will get a letter from me as I send everyone who donates a letter of thanks. I appreciate those who have taken the time to help with this project, volunteering, donating money, time or buying the Rediscovering History Book. The clock tower project is just $135,000 from being put up. It will be working at that time. We have come a long way in just 4 years of fundraising. Money donated to the project is tax deductible. Donations can be sent to Save Willard’s Clock restoration and mailed to PO Box 367 Willard, Ohio. Checks need to have Clock project on it somewhere so it goes into the right fund. Here is their web site link.- http://www.blackdiamondcontractingllc.com They give free estimates on siding and repair work. Sorry, I did pick up the book on Wednesday but have been on the go. You did a great job on the book and it portrays the real essence of Willard in the past and during the time I was growing up there! It brought back so many memories. I grew up on a farm on Rural Route 12 (used to be called B&O Pike). My grandfather built the house in which we lived while he worked on the railroad at night. The pictures of the locomotives are wonderful! I am so pleased to have it and want to thank you for the work you put into it. In fact, I am going to order one to be sent to someone living in Willard. I will get back to you on that in a couple of days. The only way I found out about the book was from reading an article in the paper but I ended up doing some research in order to send the contact form. I am sure people there know about the Clock but might be motivated to buy the book if they knew you are donating the proceeds. I don't understand why the local business owners have not contributed. Is there some objection to the project? This project has been going on for several years and I would think it would have more interest in it. It may not be the most pressing issue for Willard but it would do a lot to preserve its heritage. Also, when the Clock Project is finished, I would like to buy some pavers honoring the Laser family. Thank you again for the fantastic book. I will share it with my 93 yr. old mother and my sister. May 29, 2018 Press Release (See school photos above of Leadership class that helped raise money for the clock). Willard, Ohio: - Save Willard’s Clock committee member Kevin Casto accepts a check from the students Madie Secor, Sabastain Sivongsak, Conor Worcester and Dorian Holiday from the Willard High School Leadership class Thursday as a donation of $821.94 toward the clock restoration fund. As a school project the students took it upon themselves to do this to support their community and leadership abilities. The clock committee believes it is important the younger generation shows this kind of community involvement. It is important they understand what the town’s history is and how it should be saved for future generations to enjoy. Everyone on the committee thanks them for their initiative. The Clock project is close to being able to say, “start the build” but still needs donations to reach the level to say go. Rick Reed says, “Clock towers old and new have become majestic signatures of town squares, business parks, shopping areas, and college campuses across the country. Once completed the presence of a clock tower will immediately create a sense of place and a gathering area. The clock tower will be a historical landmark representing the old and new in town, signifying the heritage that helped make Willard what it is, a special place and time in Willard history. Reed who now lives in Indiana and others in town are the hands behind the clock tower. Reed admits the committee members are the work horse in town. Kevin Casto, Mick O’Brien, Don Shrader, Don Leininger, Don Graham, Jim Ludban, Bryson Hamons, Ricky Branham and Emily Bentz. If it wasn’t for them we wouldn’t be this far along. He appreciates their commitment to the project as well as these students. He says the tower will look as it did in 1913. The tower will have four clock faces and a carillon that could play the Flashes fight song, holiday music and chimes. We encouraged local business and residents to get involved and donate to help us reach this goal. If they can see the vision and opportunity this will bring to the town, it is a Win/Win for the community, business and everyone for the next 100 years! Donations are tax deductible. Checks should be made out to Save Willards Clock at P.O. Box 367 Willard, Ohio 44890. 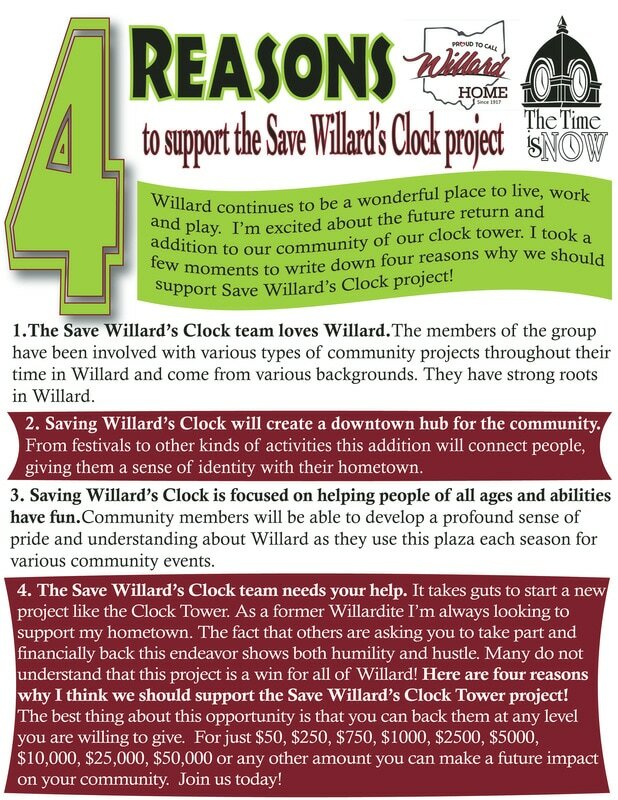 For more information on the clock campaign including videos, photos and how to support the fundraising efforts, please visit www.savewillardsclock.com or on Facebook. Se photos below of the entire class.